Neil Young News: Comment of the Moment:: Preview Reviews of Neil Young And The International Harvesters' Upcoming Album "A Treasure"
Comment of the Moment:: Preview Reviews of Neil Young And The International Harvesters' Upcoming Album "A Treasure"
From a rather perfunctory post on Preview Reviews of Neil Young And The International Harvesters' Upcoming Album "A Treasure", we saw some surprisingly interesting commentary. Whatever Old state of mind Neil was in during the 'International Harvesters/ Ways' period, it was obvious that he was deliberately attempting to distance himself from the Rock-N-Roll lifestyle as well as with his fellow musicians who chose to continue down that path. Although his era of experimentation through the eighties was well on the way, It only seemed to be a logical natural progression for Neil to seek refuge with the Country Music Community. After all, country music was rapidly gaining popularity amongst aging rockers, especially on account of the 'Outlaw' movement, led by the likes of Waylon Jennings, Hank Jr, and Willie Nelson, just to mention a few, amongst many of whom represented a fresh type of rebellious spirit which seemed more suited to a generation of rock fans who grew up with the music of the 60's and 70's, but who were now growing increasingly more weary and disillusioned over the fact that they could no longer relate to what rock-n-roll represented now that they found themselves members of the so-called establishment that the message behind the music of the 60's encouraged them to rebel against. FM rock stations were beginning to sound more and more like top-40 pop. The punk movement and disco only served to further alienate those in search of music that they could relate to where they were now. That described me during that time. While I was faithfully and enthusiastically waiting to see where Neil would go next during this period, while also keeping tabs on Dylan's 'Born Again' phase, somehow I got caught up in the 'Urban Cowboy' craze. We actually had a bar in my town called 'The Urban Cowboy Saloon'! Country music's popularity was at an all time high and I was right there in the thick of it. It was new and fresh. It was nothing more than rock-n-roll at its roots except finally it seemed that the lyrics in most of the songs were believable. They hit us where we were living now, for the most part. In the midst of the Reagan era, we had God, Country, Family, and good times, as well as the 'cornier stuff' for sure. It seemed like the only thing we were rebelling against was the things that we used to rebel against! ....The only thing that was missing was Neil Young! I remember when the band would take a break and they would fire up the juke box how much I thought how good Neil would sound coming through those big speakers. If they only heard anything off of side A of 'American Stars'n Bars' or 'Hawks N Doves', it would have blown everybody away. So many times I wanted to bring my own copy's in but the fear that they just wouldn't get it over ruled my desire to be the one to introduce Neil to the 'Country Crowd'. The fact that Neil is so deeply rooted in country is no big secret. From the Buffalo Springfield days and his first solo effort (The Emperor of Wyoming, String Quartet from Whiskey Boot Hill)almost every album throughout his entire career had country elements. Even 'Trans' had Computer Cowboy. 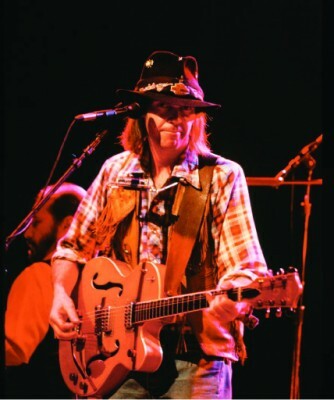 It wasn't until Harvest that he composed and recorded a country record with every intention by going to Nashville and hiring professional 'country' studio musicians resulting in what was probably one of the most influential 'country rock' albums, paving the way for such artists as the Eagles. When Neil released Old Ways in 85, critics and fans alike were convinced that Neil had finally found the direction that would set the course for the remainder of his career.That was the impression that I got from the interviews during that era. He was beginning to have issues with his hearing so it made sense that he might get away from the feedback drenched volume associated with the Crazy Horse shows. Almost overnight his politics started leaning a little to the right. He spoke fondly of Ronald Reagan and his policies. He spoke in less than flattering terms of ex- band mates as he did of C.S.&N. on the Ralph Emery Show. (Nashville Now). He found new friends in Waylon and Willie and others in the country community. Billy Talbot watched in horror and utter unbelief as Neil Performed at Live Aid with 'that country band' instead of the 'perfect opportunity' to show off Crazy Horse to the whole world. Yeah, I was sure convinced, as were many others, that Neil was going to ride this country thing into the sunset of his career. Thanks BIGCHIEF! maybe we shouldn't have encouraged you. More on the Neil Young's 1980's politics and Preview Reviews of Neil Young And The International Harvesters' Upcoming Album "A Treasure". The first sentence, 'Whatever OLD state of mind' was a typo ... I don't know how 'old' got in there. Other than that, all misspelled words and incorrect puncuations were as intended! Thanks, Thrasher! I may be biased, but what a GREAT COLLECTION OF TRACKS! No need to feel 'biased', Archives Guy! To be revisited by the International Harvester era is a welcome event indeed. Hopefully, by the time the next installment of the Archives series arrives, maybe more songs will resurface. Until then, we will have to accept and enjoy what is available. Neil's music has always had some country flavor to it to some degree. That is why it was such a natural fit for him to produce such a straight up country record. The country community were already familiar with 'country side' with Waylon Jennings having success with his version of 'Are You Ready For The Country'. Had David Geffen promoted his effort, and had Neil been motivated by commercial success, the International Harvester ride may have lasted somewhat longer. Be that as it may, we still have a GREAT COLLECTION OF TRACKS! By the way, Archives Guy ... Are we to expect more 'variations' of LeNoise, sort of like L.W.W. Raw in reverse? Adding more instrumentation? Please, enlighten us, Archives Guy!